Future Beetle Racing Tracks: A Suggestion Thread for Tracks? I don't know about you, but I am really enjoying the Beetle Racing Event. I honestly don't care if I win a prize or not; I just love the racing. I enjoy it so much that I was wondering if there would be future racing tracks built into the game. Additionally, I was wondering if we could have a track suggestion thread here on the forums. I've seen "We are Tyria Drift" [DRFT] guild videos, and I think they have some nice tracks that could be used in the game. Thanks Anet and Thanks to all the Beetle Racers out there! Nice track btw, checked the video. Here is mine! For metrica Province! The orientation is heading to left from Starting line. 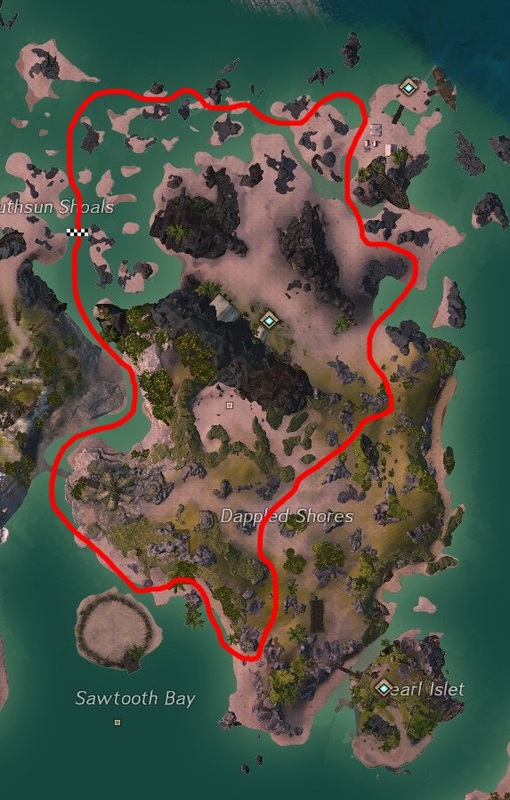 So In order on the track: Thaumanova, Greytern, Michoan, Veloxian ..... etc "Asuran Journey"
Here is another one for sandswept Isles, I called him "Complex Madness" in case of releasing some for ls maps. I like the ideas, but I'm fully against hairpin/sudden u-turns. I don't think the beetle or the drift works well enough (without a controller at least) for it to become a feature beyond improving lap times. Not submitting a map, but I think we need a Mistlock track, possibly in its own instance. It would have low gravity, vertical loops, places where you could save time by jumping over a valley (thanks to custom gravity) and maybe even parts where the gravity reversed and you raced upside-down briefly. I was thinking of something like that, but in the sky around the Wizard's Tower. But something big enough to make a GOOD track would be huge. Still, we need our "Rainbow Road". I completely agree with Mistlock Sanctuary Track. I just love fooling around there WITHOUT a mount. I wonder what they could do if we DID have the ability to mount in that low gravity area. And I do agree with the Rainbow Road. I loved Mario Kart. 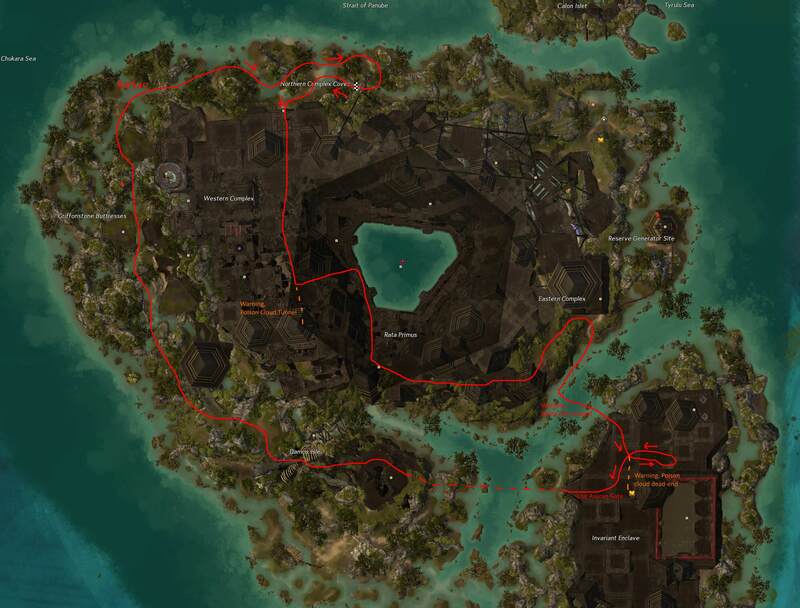 Finally, I can't design a track for ember bay, due to the very huge anti-mount area around the chalice of tears, so the left part of the island can't be used, same for the volcano at the east, the rocky path isn't made for racing, only for pedestrians. Tangled depth? I dunno have to check that out. 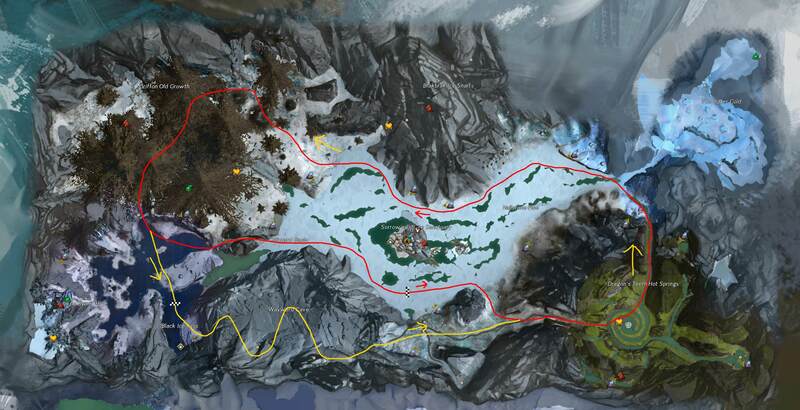 For Bitterfrost Frontier, two potential tracks, the yellow one require the ice wall at the end of the cavern to be broken during the race event. For red can be done without modifying anything. Can someone look into a track design for Southsun? That's an area that could use some racing...also...beach drifting and water skipping. Southsun, a ton of drifting on water and sand. That one is good. I would have used the berry farm area myself. Lots of galleries at all times. Hugo, is it possible to use the spiral for something on the bottom right corner in bitterfrost? Well, if you don't like hairpins, we need a Divinity's Reach 500. I'm not going to draw the track (lel circle track) but there are 2 circles: commoner level and noble level. The second floor (noble level) has a slightly harder section built in. You could simply follow the spiral by drifting for a complete turn or two and then go north as on the track. Yeah if caverns not usable, we can use berries farm and grawl caverns. 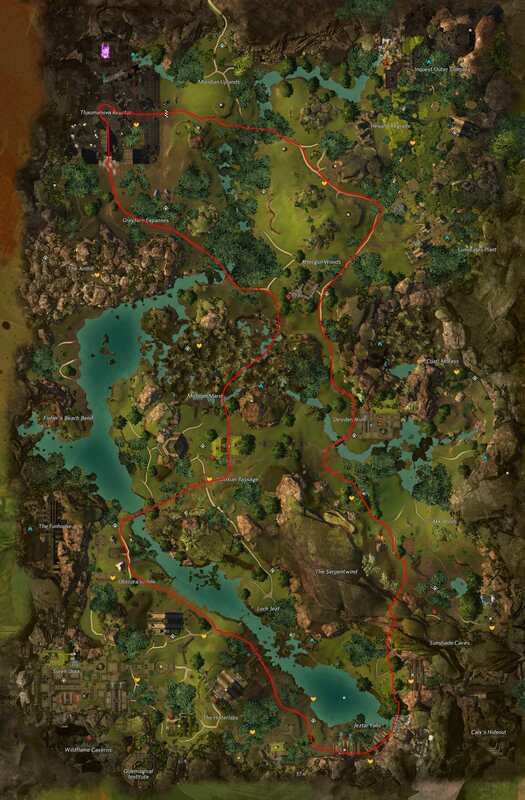 Ultimately, we want a World race and then we can finally have a Tyria Cannonball Run! Of course, we will need capes so I can combine the racing goggles and helmet an become...Captain Chaos! It makes me think about volcanic canalization in living season 3, we should have the same thing for roller beetle like a geyser. Season 3 was HoT, 4 is PoF, why not for 5, mixing every mechanics met in path of fire and heart of thorn? Those turns require practice and prior knowledge.. or simply.. learning the course. I don't have much trouble with them myself after a while as I learn by instinct how to pull of those super sharp drift turns, then add other factors such as endurance management or saving a boost to rapidly recover speed out of one. It really is mostly down to knowing the course and how to drift. Sure there are some technical issues at times like bad terrain that can mess you up but most of them can be overcome with familiarity with the track. Verdant would be an amazing place for one.. specially if some new vines were added or modified specifically for the race track and physics could be played with on extreme levels. i don't mind new tracks, i do mind using existing maps, screwing with the experience of others who don't want this game to become GTA: tyria. That is tokyo drift elite. I'm wowed. You may see me or a guildie just spiraling around there. It may already have become GTA Tyria. They can build a whole expansion up there. It's really pretty. I would also like maybe an instanced racetrack themed like Sanctum Sprint. It wouldn't be the exact same track since it's too narrow for a beetle at times and it would be downhill instead for AAAAAA experience. Make it the rainbow road of beetle tracks, you either win, or you die. I love the idea but there is something else to be considered. Not everyone participating has the mount, some players rent their mount. That being said those people don't have the same abilities that people who own the mount have. Hairpin turns and water are both not only extremely difficult but possibly impossible. If someone who rents their mount gets too wet they loose their mount. 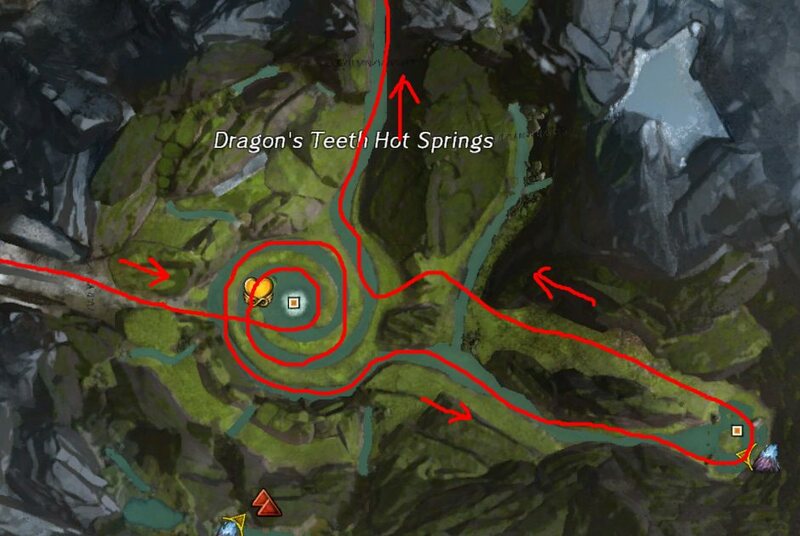 They cannot just remount, they have to go all the way to the start point to get it back (kinda hoping Anet changes this somehow) Something else to take in to consideration is the fact that not everyone is playing on a high end computer and/or a really good connection. When designing tracks, and I honestly do love the idea of new tracks, please keep these things in mind. They should put tracks inside of dungeons. This will revive the scene. After walking through them, I would love to try them out. I just can't mount up inside. I don't have a location as of yet but a pure drift track would be fun. Blood tide Crimson maybe.